Lillian Roberts almost spent Christmas in jail. The series of events leading up to December 1968 began more than a year before. New York Governor Nelson Rockefeller decided to make the Civil Service Employees Association (CSEA) the sole collective bargaining representative for state employees, rather than allowing those employees to make their own choice. Rockefeller promised to hold a representation election after a year, but he failed to keep his word. Instead, he engaged in new negotiations with CSEA*, thereby denying state employees the right to choose their bargaining representative. Lillian Roberts was Associate Director of AFSCME District Council 37 in New York City at the time. She was lending a hand to Council 50 by organizing the institutional units - state employees in mental health occupations. Roberts signed up more and more members and went to Rockefeller repeatedly, showing him the numbers. It was clear that given the opportunity, many state employees would choose AFSCME as their bargaining agent. Rockefeller refused to budge. New York’s Taylor Law, which came into existence under Rockefeller, grants public employees in New York the right to organize and to choose their representatives. The law also forbids state employees from striking. Seeing no other way to make the governor comply with the law, Roberts had to break it herself. Roberts led what she called a “rolling” strike. Employees at Creedmoor hospital in Queens were the first to walk out. When that wasn’t enough to change Rockefeller’s mind, she lead another hospital walk out. She knew she was risking jail time, but she saw it as her only option. And so Bronx hospital employees walked out. Then Buffalo. AFSCME ultimately won the strike. Rockefeller agreed to hold an election, though it would still take several months to come to fruition. Roberts received the harshest jail sentence of anyone tried under the no-strike provision of the Taylor Law – 30 days. Robert Fuller, president of AFSCME Local 69, was also held accountable for the strike and sentenced to 20 days. 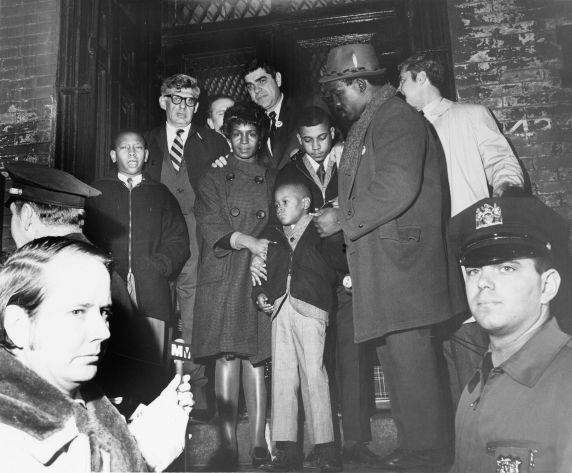 A crowd of supporters greeted them as they arrived at New York’s civil jail to serve their time. Signs read “Hospital workers support Lil’ Roberts,” “Jail Rocky, Not Roberts,” and “Jailing Leaders Won’t Stop Public Workers.” Looking on the bright side, Roberts welcomed a chance to rest after a long stretch of non-stop organizing work. Her only concern was for her children and she worried about being apart from them on the holiday. Roberts’s supporters within the state hospitals, AFSCME’s New York councils and International office, and the AFL-CIO put pressure on the governor. Finally, 11 days into her sentence, Rockefeller relented and released her from jail. Roberts was able to go home on Christmas Eve. As big as that series of events was, it was only a small part of her career with AFSCME, which began in the 1950s in Chicago. She was a nurse’s aid who became a shop steward who stood up to an unfair administrator. She retired in 2014 as Executive Director of Council 37. For more on Lillian Roberts, see Twentieth Century Trade Union Women for Social Change Oral Histories, AFSCME Communications Department Records, AFSCME Publications, AFSCME Office of the Secretary-Treasurer: William Lucy Records, AFSCME Office of the President: Jerry Wurf Records, and the Al Bilik Papers. Information on the AFSCME International career ladder program modeled on Roberts’s work in New York can be found in the AFSCME Career Development Records. More records on Roberts and DC 37 are held at New York University’s Tamiment Library. *CSEA became an AFSCME affiliate in 1978.